The Professional grade construction and design of the Proteus PAR-5500 is based on stringent European manufacturing regulations for exercise equipment. The design of the PAR-5500 makes use of both air and magnetic resistance. By combining these 2 resistance systems, you are able to enjoy the "on the water" feeling of the air resistance and the strength & smoothness of the linear magnetic resistance system. The comfortable ergo-seat has been designed in a unique way, where the seat rollers travel on the underside of the seat rail. This prevents dust and dirt from damaging the seat rail and makes for an exceptional smooth seat glide when rowing. The pivoting foot pedals have 5 adjustable levels which allows you to optimize your position on the rowing machine. The high quality and ergonomic design of the PAR-5500 makes it perfectly suitable for endurance training. During rowing, you can direct the built-in fan towards your body in order to cool you down. The PAR-5500 has an impressive over-size easy to read "Blue Backlit LCD display panel. 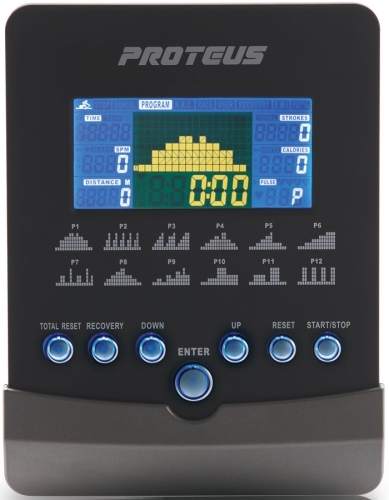 The advanced computer has16 levels of electronically controlled resistance as well as 15 preset programs that include; 6 preset, 4 user, 4 heart rate control, race/pacer and 1 watt control programs. During the programs, the computer will automatically increase and decrease the resistance according to the profiles that are displayed on the LCD-display. The 4 USER programs offer the opportunity to create your very own program and to store personal data into the computer's memory. The 4 heart rate control programs allow you to exercise within the correct target heart rate zone. 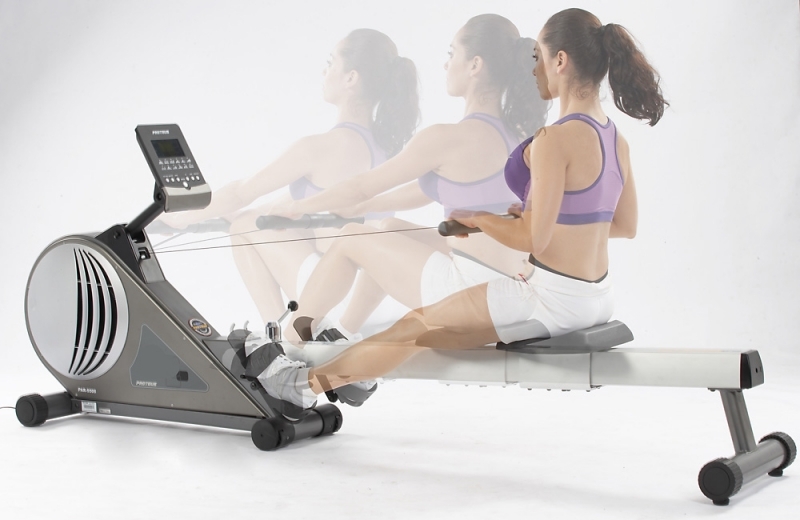 Get fit without trudging to the gym day after day with the Proteus PAR-5500 Club Series rowing machine. The professional-grade PAR-5500 makes use of both air and magnetic resistance systems to create a genuine rowing experience. The air resistance system provides an "on the water" feel, so your body will believe you're rowing on the Thames even if your mind doesn't. The linear magnetic resistance system, meanwhile, provides the strength and smoothness you've come to expect from gym machines. The machine also includes a comfortable ergo seat with unique seat rollers located on the underside of the seat rail. This not only prevents dust and dirt from gathering on the rail, but it also helps the seat glide exceptionally well with each stroke. And thanks to the pivoting foot pedals--which offer five adjustable levels--you can easily optimize your position on the rowing machine. As a whole, the PAR-5500's ergonomic, high-quality design makes it perfectly suited for both cardio workouts and endurance training. To keep your workouts on track, the PAR-5500 offers an oversized, easy-to-read LCD display panel and an advanced computer with 16 levels of electronically controlled resistance. Users can also turn to the 15 preset workout programs, which include six preprogrammed workouts, four user-controlled workouts, four heart-rate-controlled workouts, and one watt-control program. During each program, the computer will automatically increase and decrease the resistance level according to the profiles shown on the LCD display. Other features include a built-in cooling fan, transport wheels for easy transport, and a folding frame for storage. 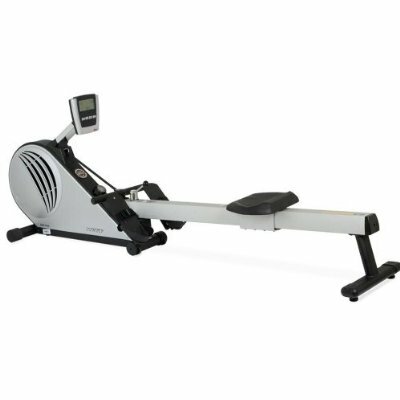 Order your Proteus PAR-5500 Commercial Club Series ROWER from FitnessZone.com today!